It's important for laboratory owners to verify that all melting, assay, and refining are handled under one roof, thereby assuring continuous control and accurate settlement. Lots are weighed and tabulated. A confirmation stating the weight and the settlement date is sent to the customer. Most settlements occur after 30 days, and the value is calculated by using the five-day average of the precious metals market at that time. The lots are combined with flux, placed in a crucible, and then put into a melting furnace that transforms it into a molten material, usually within 30-45 minutes. 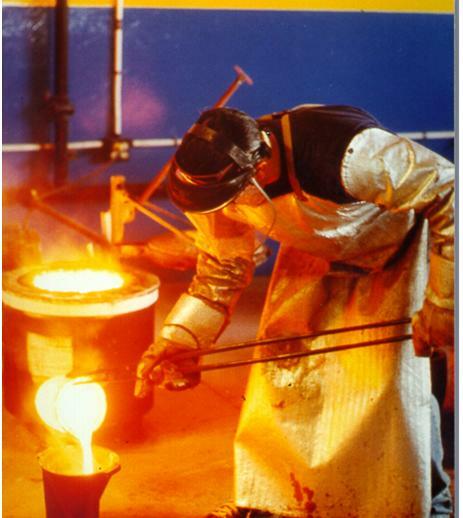 The crucible is then removed and the molten material is poured into a mold shaped like an inverted cone. The flux fuses with the undesired matter to form a slag that is lighter than the precious metals. The slag naturally floats to the top of the mold, leaving a homogenous button of metal below. The button is separated from the slag and a small sample of the button is drilled. Chemists use a process known as a fire-gravimetric assay to extract each metal. All assay performed are within 0.10% of accuracy on each element. The customer is then sent a statement of the amount of each metal in the lot and the dates upon which the value will be assessed. Once the lot has been melted and sampled, it is then re-melted and re-cooled into grains about the size of BBs in order to speed up the extraction process. The grains are then placed into a mantel where an acid solution is used to dissolve the metals into a liquid form. This process is carefully regulated by environmental agencies and refiners must install equipment to purify the resulting fumes. Once the metals are fully dissolved, chemists use other substances to induce reactions that extract each of the four metals. The results are pure Gold, Silver, Platinum, and Palladium. We then sell the extracted materials to various end users.